Twins Chatter doesn't take a holiday but do to the recent rash of poor play we are taking the day off to rest our poor heads. Yesterday the Twins and Kyle Lohse finally got back into the win column. This coming after a week of terrible play against below average competition. Don't get the wrong idea, we at Twins Chatter are not fair weather fans (anyone who was around during the mid to late 90's could not be), we just have high expectations for our team. Luckily there is some good news. The team is two games out of first and looks to be getting pheonom Joe Mauer back within the week. In a lot of ways this swoon has come at a much better time then last years'. If the team can begin to pull things together it will be setting itself up for a strong summer. Still, there are things that concern me with this team such as improved competition from the White Sox this year, our own inconsistent play, and too much being expected from a guy who has played in exactly one major league ball game. This will probably be a topic of a future column this week. Until then make sure to cast your vote for us to be in the World Series of blogs. We are so new to this but are very excited whenever we receive any recognition. Hope to see you back here tomorrow at your source for insightful, thoughtful, and somewhat opinionated Minnesota Twins coverage. Third base coach Al Newman, who drills the infielders, said Cuddyer can be a better second baseman than a third baseman. "We didn't spend hours upon hours at 7:30 in the morning on field number six [in spring training] taking ground balls and working on double plays for me not to feel like he's comfortable enough over there," Newman said. When Cuddyer is playing third, the Twins coaching staff believes he tends to stand up when balls are hit toward him, instead of making his first move toward the ball. Second base doesn't demand the reflexes third base does. "If you watch his body language, he's definitely more comfortable over there," Newman said. "More than he is at third. I don't think he doesn't like third, but I look at body language and he's more comfortable [at second] than at third base." I began writing today with the thought that I would once again state my opinion that Cuddyer could not be the Twins everyday second baseman. These few quotes by Al Newman aren’t going to sway me entirely, but they are very interesting nonetheless. Watching Cuddyer play second a handful of times early in the season, I was extremely unimpressed with his defense. He was not getting good reads on groundballs, and he was not displaying the soft hands that are so crucial for a middle infielder. I could not believe that the Twins organization, the same one that had benched Todd Walker for his defense, would put such a poor fielder at a crucial position on the infield. Now, I’m not crazy about Rivas, but you can’t say he doesn’t turn the double play as well as anyone in the league. Louie’s range isn’t spectacular by any means, but he makes Cuddyer look almost like Jose Offerman out there (notice I said almost). To me, the epitome of Twins Baseball™ is good defense and pitchers that throw strikes. When it all comes down to it, I’m a firm believer that it is those two things more than anything else that helps you win ballgames. That’s what TK always says, and I’m a huge TK guy (come on, how can you not be?). As much as I love their bats, starting guys like Matthew LeCroy and Cuddyer in the field directly contradicts this basic principle. But Newmie’s quotes here are interesting. When Koskie went down, I thought it was finally Michael Cuddyer’s time to shine. He had the chance to play his normal position, third base, every single day. But Cuddy performed well below expectations at the plate and especially in the field. I can recall at least a few instances where Cuddyer didn’t even come close to fielding balls that Corey vacuums up handily, simply because Cuddyer doesn’t seem to react quickly enough. Whereas Koskie does a great job of staying low and just reacting to the ball, Cuddyer does have a tendency to come up before deciding how to approach it. How many balls did we see go through the hole between short and third in Tampa Bay, just out of Cuddyer’s reach? How many at Metrodome against the ChiSox? Perhaps Cuddyer can make some in-season adjustments and become an adequate second baseman. No one is in a position to say anything definitively just yet. All I know is that he still has a ways to go before he gets to that point. But if Al Newman sees some potential, then I suppose I can hold off on any final judgment for at least a little while. Unfortunately for Cuddyer and the Twins, however, the clock is ticking. It's a busy time of year for the Twins. They are right in the thick of a real, all out dog fight for the division. They await the return of some of their injured players while others continue to go down. The team is witnessing impressive performances and some not so impressive ones. And for the first time in years the team may be willing to part with prospects to be active players in the trade market. In all, a lot is going on in Twins land right now. This should be good news to every Twins fan out there. This move allows the team to move Michael Cuddyer to second base finally giving them some infield depth. While Cuddyer's bat has been relatively hot, his fielding at the hot corner has been below adequate. Koskie should give the defense a much needed boost while his bat will be a welcome addition to the lineup. He is the first step in the Twins getting back to full strength. Let us all rejoice! No more Henry "I can't buy a hit, heck I can't hit a ball off a tee!" Blanco. Mauer is not only a major boost for the offense, his presence behind the plate is also an addition. Matt LeCroy can do a lot of things but one of them is not throw out runners. Mauer will solidify the bottom of the order, call a great game behind the plate and keep runners honest. He brings a new life to the team, a star quality. Every time he bats is exiting to watch. The guy hit two homeruns in a game Tuesday. The time is quickly approaching where we will finally get to see Mauer up close on a daily basis. Bet on that run in the standings never happening. This Royals team is bad. They have no pitching and many of their free agent signings where old and over the hill. On the surface it looks like a good thing for the Twins that there is one less team in the race. Depending on where the Royals ship their guys it could actually make things harder on the Twins. The Twins could have to deal with getting Carlos Beltran or Mike Sweeney out in the postseason. Judging from the games played so far this year against the Royals, that is a scary proposition. This is every Twins fan's dream, acquiring an ace for a push deep into the playoffs. Too bad there are none out there and those pitchers available will come at a high cost. Garcia has been great so far this season with a 2.71 ERA and 6.86 K/9 but his career has been mostly up and down. He has pitched great in the playoffs against the Yankees though and when on, is tough to beat. Benson had major arm surgery over a year ago. He has a 4.61 ERA and 5.98 K/9. He has always had potential but has not lived up to it. Perhaps an escape from the Pirates would do the trick. His stuff might make him a better postseason option then Garcia. Since he has never been there, nobody knows. Then again a certain 21 year-old from Texas had never been there before last year's playoffs and look how that turned out. Reaching base 5 times in 5 tries is not easy. This guy continues to hit and he isn't going away. He creates things for the offense. His short swing is likely to keep him from any extended slumps. He hits the ball hard and when he doesn't still manages to find a way to get on base. Now he is batting lead off and setting the tone. His performance in that spot has so far been admirable. A .344 average puts him just out of the top 5 in the American league. Incredible, that's the best word to describe his play so far. He is un-hittable right now. He has given up 3 runs all year! Not only are teams not scoring off him, they are no longer getting on base. It's such a luxury to enter the ninth with a lead and have the win be automatic. Not a bad start to his major league season. He can flat out mash. His swing is filled with power and the potential of homeruns. He is going to stick this time. The Twins would not have called him up if they weren't ready to hand over the reigns. Now is the time to let him go out there and play. He is going to put up numbers and he is going to go through slumps. Most power hitters do. Patience is key. Other teams have to respect his potential in the lineup. He is the one guy capable of rocking a pitch and taking the team from a 1 run deficit to a 2 run lead. I was really impressed with how he played against the White Sox this weekend. He didn't back down. He was a large part we won the game we did. The Twins are doing it right by batting him lower in the order to take some pressure off to start. The beginnings of a formidable lineup are in place. Unfortunately (or perhaps fortunately) I wasn't able to catch very much of Tuesday's 6-1 loss to the Devil Rays for a variety of different reasons (the most notable of which being my 15-page Russian history paper) but looking at some of the stats I'm not all that sad I missed it. I know the Rays are hot, but come on! We had won 11 straight against the perrenial bottom-dwellers! I only hope that this current slide doesn't become last year's infamous pre All-Star break skid, at the end of which the Twins will find themselves looking up at both the ChiSox and (*shudder*) the Tigers. Kyle Lohse was once again subpar (4 ER in 6 innings). This guy just can't buy a break--many starts he is able to hold it together through five but just can't seem to avoid trouble in the sixth or seventh. The Twins were also unlucky enough to catch the enigma that is Victor Zambrano on his only good day of the entire frickin' month. The guy has electric stuff, no doubt about it, but has been terribly inconsistent so far this year. His April ERA was a solid 3.73 but for May it was (before Tuesday) a bloated 11.00. It also doesn't say much for the Twins' allegedly improved plate discipline when they are only able to coax 2 walks out of a guy that had walked a mind-boggling 44 batters in 55.1 innings before Tuesday (including single game totals of 7,7, and 9!). The only hightlight was once again Justin Morneau. I know we got a taste last year, but man is this guy good! He is so naturally strong that I think his new nickname should be "Popeye". Kinda catchy, isn't it? They must really be patting themselves on the back in White Sox land today after their strong weekend showing against the Twins. Let's be honest, it wasn't merely strong showing, it was a thumping not seen 'round these parts since the 2001 NFC title game. All a fan can do is tip their cap to the Sox. They won this round but they still have a mountain to climb to win the division. 1. It is still very early - Games in May are important but the baseball season is a marathon. Are the White Sox capable of winning the big game? What about against their division rival, in September, when they need it? They will need to overcome past demons to do so. 2. Most of the Twins starters did not play in this series - That's right; no Koskie, Mientkiewicz, Stewart, Mauer or Rivas. The White Sox bullied a battered team that until recently had dealt fairly well with its rash of injuries. Now they seem to be in a transition where too many guys are out and they are figuring how the pieces fit. 3. The Twins defense is never that bad - Jose Offerman at second base? This is an indirect effect of the injuries. When the right guys return other teams will have to work more to score runs. Defense improves every facet of the game. The pitches are more confident, the hitters have less of a hole to come back from and the other team scores less. 4. Twins pitching will improve - It is not a stretch to believe this is going to happen. Johan Santana had no command of his pitches this weekend and as a result got shelled. Seth Greisinger will give way to a more viable option if he continues to lay an egg. Kyle Lohse did not get a chance to pitch in this series but just ask Paul Konerko what he thinks of facing him. The jury is still out on Carlos Silva. He has followed a great start to the season with two very lousy outings. Chances are his overall performance will fall somewhere in between. The bullpen was up and down all weekend. They were strung out and not used in anything close to ideal situations. When they are set up properly they have looked very good this year. It all starts with improved starting pitching. 5. The White Sox wanted this series more then the Twins - They are the ones with something to prove. The Twins don't worry, they are trying to work some things out right now. Of course there are concerns but the Twins have shown in the past they are more then capable of getting through problems. The White Sox have yet to have problems this year but in the past have crumbled. Maybe with Ozzie Guillen things will be different this year. They would have to start by upgrading their pitching. Outside of Buerhle, their starters are not good. Loiza was great last year and has done alright thus far but has not shown the same stuff. The Twins hit Jon Garland hard on Sunday and with any kind of a pitching performance would have won the game. The White Sox bullpen is one big roller coaster ride. The White Sox don't play defense like they should and some of their hitters are streaky. Add it all together and you have got one very large team slump somewhere on the horizon. Add it all up again and what you get is another great race for the summer and Twins division championship in the fall. This weekend the White Sox came into our house and took 3 out of 4. That is baseball. The manner in which it occurred was disturbing but that happens sometimes. I've said it before and I'll say it again: the White Sox don't deserve the Twins respect until they've earned it. Earning it can only come from going to the playoffs. They are a better team than last year but the Twins are still above them. The Twins took the Sox’ best punch this weekend and they are still standing. What a difference four days makes. The last time I wrote, May 19, the Twins were riding a wave of momentum. Matthew LeCroy had just put an exclamation point on what had been a very impressive nine game stretch for the team with his ninth inning game-winning grand slam against the Blue Jays. From May 11-19, the Twins went 7-2 overall, including a sweep of the Mariners at home and winning series in both Chicago and Toronto. Despite the omnipresent injuries, things were falling into place nicely. I don't care what school of baseball thought you subscribe to; there is absolutely no way in to put a positive spin on any of those numbers. I was one of the unfortunate 22,859 people in attendence at today's game. I was really looking forward to the game beforehand. It was Shannon Stewart bat giveaway day (I'm a sucker for promotions) and Saturday's win had me thinking that the Twins were poised to salvage a split in the series and head to Tampa alone in first place. Plus, it has been raining here for like 5 days nonstop and I was looking forward to catching some live indoor baseball (note: this is the ONLY circumstance in which the Dome is a positive). I'm sure most of you caught at least some of the game (or watched the "highlights") and to make a long story short, it was the epitomy of an ugly loss. I knew we were in for a long day when Johan had some unfortunate circumstances (bloop hit, bunt single, outfield misplay) cost him 3 early runs. But when the Twins took a 6-3 lead in the 3rd, I thought the Twins had a good shot to pull out the "W". Then came "The Neverending Story" also known as the top of the 4th inning. Oh, the horror. That is something I would rather not relive. Needless to say, people started exiting the Dome by the 5th. Even yours truly commited this terrible sin and left after the 7th (with the score 17-6). Hopefully, the baseball gods will forgive me. After this past weekend, I'm sure most Twins fans are wondering when the wrath of the baseball gods will subside and we can get back to the good ol' days: last Wednesday. Interesting note from Jimmy Souhan over at the Strib sports section: "Top pitching prospect Jesse Crain, who has been hitting 98 miles per hour on the radar gun, was the Twins' minor league player of the week after pitching three perfect innings at Rochester. He's 2-2 with a 2.38 ERA and nine saves." Anyone think this weekend's pitching implosion may hasten the call-up of the game's top relief prospect? Only one word can describe a day like today. Wow. That’s all I can say. The thing is, had I looked at the calendar a week ago, I would have pegged this day, May 19, as a potentially crappy day. I had a final (albeit a rather easy one) and I have a killer psychology test looming over my head that I have studied little for thus far. But today, enough great things happened to not only overcome today’s pitfalls, but to transform this day, May 19, into one of the most exciting in Minnesota sports history. That’s exactly THREE opening day starters- a lousy THREE!! Awfulman batting cleanup (again)!? Blanco and Prieto back-to-back? Not exactly a lineup that strikes fear into the hearts of opposing pitchers. But somehow (as I stated the other day) the Twins simply find a way to win! Twins pitchers, most notably a Mr. Juan Rincon, made the victory all that more dramatic, but no matter. Today’s “hitless wonders” battled all day long at the plate, but it took until the ninth for the pot to boil over. Down 5-2, singles to the outfield by Hunter and Cuddyer were followed by an INFIELD SINGLE (!) by Blanco (I know, I almost went into shock too). That set the stage for today’s hero, Matthew “Big Country” LeCroy. The only man left on the Twins’ bench (not including Jerry White or Wayne Hattaway) absolutely crushed a Terry Adams fastball over the centerfield fence for a grand slam! I was watching the game by myself but I couldn’t help jumping up and yelling for joy! My behavior earned me a couple of confused stares from passer-bys, but who cares! Joe Nathan came in and slammed the door, capping what was one of the most satisfying regular season wins in a long time. Bring on those ChiSox! Unfortunately, it seems that the buzz from today’s spectacular Twins game will be overshadowed by the Wolves Game 7 win over the Kings. But I’m just as excited about the Woofies! Great win for them as well, and a very entertaining game to watch. 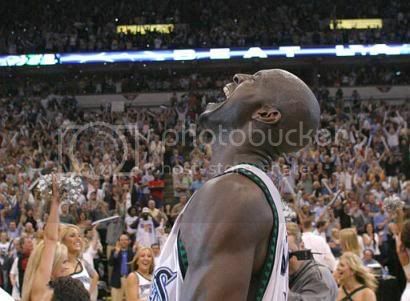 KG finally played like an MVP should, and all I can say is that it's about frickin' time! I’ll bet there wasn’t a person in the state who wasn't holding their breath as Webber launched that three as time expired. But hey, “a win is a win” as they always say! We'll all take it! Overall, it was a very emotionally draining day. But still a good day. I can still only think of one word to describe it all: Wow. Today is my birthday and I was thinking about how thankful I am for the Twins success so far. Luckily, for me, a lot has gone right lately so I have been in an altogether good mood as a result. I have an extra bounce in my step and I get to talk trash about the White Sox. The Twins being in first place is one of my best birthday presents. I am most thankful for the off-season trades the Twins made. Where would this team be without Carlos Silva and Joe Nathan? Silva probably can't keep it up as he got lit up for the first time in his past start. Still, he's got himself a nasty sinker that has yet to induce groundballs at the rate he is used to. With a solid defense behind him his performance should remain strong once hitters begin to put the ball on the ground. Nathan got off to a shaky start but has quickly taken to his role. Having a closer that doesn't give everyone a heart attack is a godsend. This guy is automatic and a pleasure to watch. Christian Guzman appears to be back and that means only good things. As he continues to gain confidence there is no reason to assume he will falter anytime soon. This guy pressures defenses and sets up the Twins lineup at the top of the order. He can also be one of the most exiting players in the game to watch, though also one of the most frustrating. Michael Cuddyer is finally getting regular at bats. We have been waiting for this kid for 5 years. All along the way we were told that he could hit and then he got to the majors and never really was given a chance to. In limited action he has been mediocre with flashes of power. Now, all Twins fans get the chance to see if he was worth the hype or if it is time to cut bait. So far he has produced in his role and I expect he will continue. Joe Mauer is on his way back. This is a double bonus because that means we won't have to suffer through too many more Henry Blanco at-bats. No one knows for sure how fast Mauer is progressing but he is steadily improving. That means he should be back within a month at the latest. This is an upgrade both in the field and at bat. Forget No Name Steaks, the No Name Bullpen is quickly becoming the best deal around. Roa, Rincon, Fultz and Muholland all are giving the Twins quality innings at a discount price. These guys are keeping the team in games and are proving to be better then advertised. This is yet another key to the team's success and more proof that Terry Ryan is one of the best general managers in the game. I'm thankful for a starting rotation that seems to be putting things together. Heck we don't even need Rick "Longball" Helling anymore. The rotation is no longer just keeping the team in games, it is starting to win some. This team was a fluke without its starters. Even Kyle Lohse pitched decent in his last outing giving the team a chance to win no matter who starts. Jacque Jones ate his Wheaties and now he can hit lefties. This guy is straight-up scary for opposing pitchers. He is the best pure hitter on the team and capable of someday winning a batting title if he can keep it up against the southpaws. Take that Royals- what do you think of your 4 lefties in the rotation now? I have thought Torii Hunter was overrated for years but right now he is going through one of his patented hot streaks that make everyone love the guy. Torii, it is really nice to have you back in center and providing the power this team needs from you. Lew Ford is back to raising his batting average which bodes well for this website. We were getting worried that perhaps we had errored in so quickly jumping to proclaim him our official player. He continues to reward our faith as do you, our readers. We are thankful for your support always and that we have the good fortune of following a great baseball team. Here's hoping my birthday present is a series win up in Toronto tonight. Peter Gammons is Ripping Off My Ideas! While perusing through my daily Internet baseball site, I came across this article by Peter Gammons. I think it ties in perfectly to my post for today (see directly below). After you read mine (keep in mind that I'm no Peter Gammons- at least not yet) I encourage you to click on the following link and see what Gammons has to say on the subject of our Twins. Very solid piece: ESPN.com - Gammons: Budgetball. 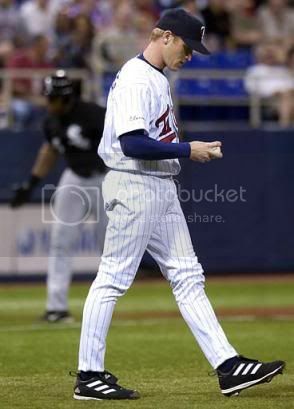 Monday’s 9-5 victory over the Blue Jays at Skydome really got me thinking about the Minnesota Twins franchise. Now, the game in itself doesn’t appear to have been that extraordinary. Radke pitched well but not spectacularly; J.C. did not pitch that well but was hurt by a couple of unfortunate defensive plays (Hunter’s near-catch on Cash’s double and Rivas’ poor relay to Guzie on Delgado’s grounder); and the bullpen blew a three-run lead. But lately, I think that the rest of the country is finally figuring out what Twins fans have known since 2001: this is a franchise that has it figured out! Now I don’t mean to say that Terry Ryan can predict the future or anything, but things seem to work out for the Twins more often than not. 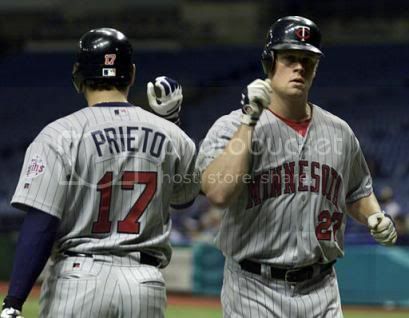 I honestly believe that most people around the country thought that the 2002-03 Twins were a fluke: the team had gotten lucky when a bunch of talented players hit the big leagues at the same time, nicely complementing the pieces already in place. Many thought that once that little “bubble” was broken this past winter the team would spiral downward and join the rest of its small-market brethren at the bottom of the standings. Obviously, this has not been the case. Monday’s game perfectly exemplifies the spirit of these Minnesota Twins. It doesn’t matter if things look like they are spinning out of control- someone will inevitably step up and right the ship. Monday that someone was Jacque Jones. Strangely enough, even though J.C. had blown that lead in the 7th there was no doubt in my mind that the Twins would win that game. Even when Nakamura looked so tough in the 8th my faith was not shaken. Even though the Twins were playing on the road, I did not falter. In my mind, it was just Jacque’s turn to step up. I’ll bet JJ will say the same thing. What is it that separates the Twins from all those other teams that languish in futility? Is it the front office? Is it Terry Ryan? Is it Ron Gardenhire? Even TK perhaps? Or is it simply luck? And yet another question: Why have the Royals been so unsuccessful in trying to emulate the follow-up success of the 2002 Twins (coming off their nice 2003 season)? I don’t think there is a simple answer to that question (although Rob Neyer tried recently), but it is an interesting topic to explore at another time. In the meantime, fellow Twins fans, we need to realize just how fortunate we are to have a franchise that defies conventional “logic” and just keeps on winning. Monday was just one more drop in the bucket. I'm sorry to report that we were unable to get a new Twins post up today. Things have been busy up here on "the hill" as we say at St. Olaf. This is finals week- need I say more? Perhaps by Monday afternoon I'll have a post up (probably dealing with the Helling and Greisinger controversy- although the Geek has a nice article about that already today. If not, we'll for sure have something new up on by Tuesday. For any of you MIAC students/alums out there (and I know there are at least a couple of you that read this blog) the MIAC baseball tournament was held this past weekend here in Northfield and Dundas. This is one of the reasons that I'm going to bed right now- I'm dead tired from a weekend of nonstop baseball. Unfortunately, St. Olaf was eliminated and those blasted Tommies from St. Thomas will once again advance to the NCAA Division III regionals. I liken the Tommies to the Yankees; they don't rebuild, they just reload. Hopefully someday they will meet their comeuppance. With the St. Olaf season done, I am now able to focus much more on Twins baseball. After all, isn't that the most important thing of all? The end of school is near, and summer is fast approaching. We appreciate all of you that have stuck with us here at Twins Chatter. I look forward to a summer filled with some great writing. They are separated by a game in the standings and they open a three game series tonight. The Twins and White Sox are quickly becoming one of the most heated rivalries in baseball. Only it's not really a rivalry yet. A rivalry would involve each club getting the best of the other at some point. Up until this point it has been all Twins which burns at the very center of the White Sox franchise. After all they are supposed to be the last remaining big market team in the central division. The last two seasons the division was theirs for the taking and they choked. What is different this year is the manager. His name is Ozzie Guillen and he is the polar opposite of the fired Jerry Manual. He is head strong, inexperienced, at times obnoxious and perhaps just what his team needs. Then again he could be the match under the powder keg that just needs a spark to explode. These White Sox are still filled with high priced, no defense players who are stars but have never shown the ability to play together for a whole season. The Big Hurt is also the big cry baby who goes away when his team needs him most. Paul Konerko is inconsistent and Jose Valentine is the most erratic shortstop in the league. What really hurts the Sox is their lack of pitching. Last year it was a problem and this year there is less depth with the loss of Bartolo Colon. So far they have been saved by the surprising performance of Scott Shoeneweis who has 3 wins and 3.49 ERA. With Esteban Loiza still pitching like as if it were last year, the always reliable Mark Buehrle and the realization of talent by Jon Garland, they have been able to field a reliable rotation so far this year. The likelihood of all those guys keeping it up is slim though. When that happens they will be forced to rely once again on young starters and a shaky bullpen, where Billy Koch or whomever else they trot out for the ninth has been far from certain in the closer role. Who ever said this coming series with the White Sox was one of the biggest of the year had it all wrong. The Twins have more depth than them and are unlikely to experience the same drop off as the White Sox. On the contrary the Twins with returning players can only get better thus leaving the White Sox in the dark yet again. Until the White Sox are able to step to the plate and win the division they do not deserve any more respect that that. What ACTUALLY happened: Rick Anderson still had a one year’s supply of his patented “magic pixie dust,” but unfortunately Joe Roa snuck into Anderson’s locker and used it all up. Naturally, the bullpen has only been human in May. We think: Lew Ford was one of the league’s best hitters in April. Actually: Sensing an opening for an official player at a newly-formed internet blog called “Twins Chatter”, Lew sabotaged Torii Hunter’s cleat so that he could move up to the big leagues. He knew he would soon perform well enough to be recognized on Twins Chatter, something that was one of his life goals. We think: Joe Mauer was injured after 14 innings of play but finished April with an OPS of 1.583. Actually: Manager Ron Gardenhire is only using this “knee surgery” thing as a cover story so that he can rest his young catcher for the ever-important stretch run. We think: Carlos Silva, the same Carlos Silva who had started exactly ONE major league game heading into 2004, won five consecutive starts. Actually: Terry Ryan found a different pitcher in the Phillies organization, one who is also named Carlos Silva. The “real” Carlos is still back home in Venezuela due to visa problems. We think: Five Twins players made trips to the DL before the season had barely begun. Actually: AstroPlay, the company originally commissioned to install the Metrodome’s new surface, employed undercover agents to improperly install the Dome’s Field Turf in a last-ditch effort to discredit their competition and save themselves from bankruptcy. We think: Luis Rivas reverted back to his normal, terrible form. Actually: Luis Rivas reverted back to his normal, terrible form. We think: Jacque Jones finally acknowledged the importance of drawing the occasional walk. Actually: Hell froze over; this was only a natural consequence. Anybody have potential inconsistencies of their own? Drop them in the comments section below. For the third week in a row we have tweaked our regular Sunday feature. While we kept it easy to read we decided the name didn’t quite fit us so we changed it to "Sunday Chatter". Same format, new slick name! These are exciting times to be a fan with the team battling for first and the games back on television. We appreciate all the support we have received so far for this site and we hope to continue to provide quality fan perspectives of what happens every day with this team. If you would like to contribute anything to improve the site or a general comment email me at johnbetzler@hotmail.com or Ryan at twinsfan21@msn.com. Obviously, the big news of the weekend was the new TV deal. What does being on television really mean for this franchise and its fans? John's Response: “It goes along with the old adage about a tree falling in the forest with no one around to hear. Not being on TV was hard on even the most dedicated of fans. It really caused a rift with the casual ones. The Twins allowed themselves to lose ground, during their great start, to both the Timberwolves and the Viking’s draft. I'm saddened that Victory did not work out because in the long run it would have been better for the team. But you have to weigh which is more beneficial, the cable revenue or a new stadium. Either way I'm just happy I can come home after a long day and relax with my favorite pastime again." These last two series against the Mariners and Athletics, the Twins have looked less than spectacular (to put it lightly) in losing 2 out of 3 to each team. Which do you think is the "real" Twins team: the one that played so well in April or the one we have seen in May? JPB: “The team was inconsistent last year, and until all their players are healthy it might be difficult to expect anything else this year. This team played very well in April without all their parts. Now some have returned while the guys who filled in so admirably are losing a bit of steam. It has to be a readjustment for the team, but luckily this organization has lots of depth and options to call upon when something goes wrong. Soon Matt LeCroy, Joe Mauer, Grant Balfour and Rick Helling will all be back. That should give the team stability and right the ship before it gets out of hand. What really scares me is that they lost to a bad team in the Mariners but west coast trips can be rough." RM: "I have to agree with you about the West Coast trip. They can be rough, but the Twins have handled those teams pretty well in the past (the 2002 Mariners notwithstanding). It's not a good sign to see them losing all these games now, especially when they are games they can and should be winning. I'm somewhat of a pessimist, but I'm not going to give in and say that the Twins will be the mediocre club many experts predicted them to be before the season. This team probably isn't as good as they looked in April, but they aren't as bad as they looked today (Sunday) either." Matt LeCroy is returning from the disabled list this coming Tuesday. Of all the Twins players who have been hurt, who are you most excited to have back? RM: "For me, this question is a no brainer: Grant Balfour. I know what you're all thinking: ‘What about Joe?! ?’ Well, for the sake of this discussion, I'm not including Mauer. Reports indicate that he is at least 2 weeks from coming back, and I don't think he's going to jump-start this team offensively, especially not right away. Balfour is the guy the Twins have REALLY missed thus far, and that was no more evident than in today's game. Juan Rincon has been struggling with his command lately, but Gardy had to put him in a situation where the Twins really needed a solid relief effort. I could tell as soon as he threw his first pitches that Rincon was not going to be that guy. Unfortunately, there really weren't any other viable options left in the pen. Balfour has a chance to take over LaTroy's former role and run with it." JPB: "Offense has not been the problem with this team. As exited as I am about the return of Joe it is pitching where this team really lacks depth. I'm not so sure about Balfour. He has an amazing arm but he hasn't done enough at this level to put faith in him succeeding in tough situations. The return of Helling could be the key. He isn't going to put up amazing numbers but he can do something Seth Greisinger has not and that is contribute innings. It is all a domino effect after that. Suddenly, there is less pressure on the bullpen because they have less innings to pitch. They can rest more and Gardy can actually play match-ups. I'm also exited about the return of the other Joe, Joe Mays that is. Before the season is over he will contribute something to this team. His arm could be a god send mid season for this bullpen." "Fact or Fiction: Kyle Lohse will endure yet another season as a middling, inconsistent, mediocre starting pitcher." JPB: "Fiction, Kyle Lohse will endure no more then 3 more starts. Then he will find himself in the minors where he can get his head straight. Hopefully he will return a la Joe Mays in 2000 and be a new man. I’m really disappointed in his start to the season because he was poised to make this the year he stepped up. He has too much potential for the team to keep throwing him out there to struggle." RM: "Fact. I seriously thought coming out of spring training this was going to be the year that Lohse harnessed his immense talent and had the season that he is capable of. That's not going to be the case this year. His problems are the same problems he has always had: location of the fastball and inability to throw his outstanding curveball for strikes. He falls behind in the count too often and is forced to groove a pitch, and he hangs his curve WAY too often. It is too bad; because this is the year the Twins were really counting on him. I think he ends the season with an ERA in the mid-4's once again. Maybe 2005 will be his breakout year..."
Wow! What a strange turn of events! At about 9:00 pm Friday, it was announced that the Twins had reached a new 8-year agreement with Fox Sports Net North for the rights to broadcast Twins baseball. I don't know about you, but I was completely caught off guard when I heard the announcement. My initial reaction was the same as most Twins fans I'm sure: GREAT! The Twins are going to be back on TV! What could be better than that!? But this new development also raises a ton of new questions, not only about the TV situation (namely the financial terms), but about the future of the franchise. Why did they sign such long deal? Was the deal reached because the Twins felt it would help with the stadium bill (which suffered a big setback in the House on Friday)? Will the failure of Victory have any long or short term financial implications for the team? Were the financial terms offered by FSN actually half decent? Personally I think it had a lot to do with today's stadium development. The team realizes that Victory will be all for naught if the team can't get a new stadium soon. That's all I'm saying today. John will probably have a more detailed analysis tomorrow. As I type now, the Twins-A's game is not going so well. The Twins have issued an astounding 10 walks, and you aren't going to win too often when you do that. It's tied 9-9 in the 10th, and the game is in the hands of Terry Mulholland. 'Nuff said. But even if we lose today, I will still consider it to be a good day. Rejoice, fellow Twins fans! Rejoice! The last 2 days have been a little hectic. It's the end of the school year and I have to move out of my dorm this morning. Throw a couple of finals on top and the Twins have been my one chance to relax. Throughout this I have done my best to still reserve time to write for this site as Ryan and I both believe it is important to have something new almost every day of the week. Needless to say, tonight's entry will be just a few brief thoughts on last night's game. Our first guest columnist is coming later this week. I love baseball and the more of it I can get, the better. However, it was still refreshing to have a brisk game last night thanks to the excellent pitching performance of Carlos Silva. He is quickly developing into the ace of this staff! What's more, he continues to build on each start. Last night's performance was particularly needed for a Twins team in the middle of a 3 game losing streak. Where would the Twins be without Carlos Silva? He is 5-0 and has given the team innings that is has sorely needed. The rest of the starters have been inconsistent yet are showing signs of coming out of the woods. Silva is not likely to keep this pace the entire year but I could see him putting together a really nice season. Perhaps 15-17 wins, much like 2001 version of Joe Mays. The Twins gave him a chance and he has more than repaid them for it. What he has given the the rest of the staff is time to work through their problems so that when he inevitably falters, they can pick up the pace. What the Twins need to be careful of is not overworking Silva since he has never thrown that many innings in a season before. As long as he stays around a hundred pitches or so a game, he should be all right. Why does Gardy hate Lew Ford? He is among the league leaders in hitting yet he batted lower than both Cristian Guzman and Jose Offerman last night. Of course Ford had another great game and is producing wherever he hits, but the team is not using him where he can contribute the most. Jose Offerman should not even be in the lineup. He is a veteran presence on the bench for pitch hitting- that's it. His bat speed isn't good enough to be in the everyday lineup, let alone bat 5th on a playoff contender! He has been terrible of late and although he deserves a spot on the team (because he is capable of coming up with the big hit), those at bats could be spent elsewhere. Michael Cuddyer or Mike Ryan each would have been better options. The Twins have not taken advantage of the opportunity to see what they have in Cuddyer. He hit a homerun on Sunday and yet doesn't get the chance to build on it. He isn't a second baseman but surely he can DH! Why are we wasting ABs on Offerman when that is not his role? Ford could have hit second in this game and Cuddyer fifth. If nothing else Ford should have been hitting fifth in the order. Maybe the Twins are afraid of bunching all their terrible hitters at the bottom of the order but as it is they seem to be wasting a lot of Shannon's at-bats. I don't even want to talk about the poor play of the middle infielders anymore. They have pushed the outer limits of futility but the other options are still not that much better. I will say I was happy to see Rivas's double and he keeps teasing that he is ready to come out of his slump. Guzman still has no excuse for last night's baserunning gaffe. I saw the replay on ESPN and it was a TERRIBLE brain freeze. The team finally hit the ball a little bit last night, which was good to see. Jacque Jones homered to the opposite field, which is a great sign of things to come. This team is fun to listen to when things are working. Joel Piniero used to be good but the Mariners overworked him and he is having trouble recovering. Signs are good that Grant Balfour and Matt LeCroy could be back early next week. This means it will soon be decision time for the Twins. Of course the Twins will demote Rob Bowen and hopefully start LeCroy at catcher when he returns although I see them more likely easing him at DH to at first. When Balfour returns the team should ship out Seth Greisinger. He has done a good job giving the team some innings but that's about it (note the 8.10 ERA). Muholland is more valuable in his role and Joe Roa can be stretched out if they really need an extra starter. Roa has been head and shoulders above Greisinger so there is no reason why the Twins would demote him. When Helling and Mauer returns there could be some more difficult decisions coming. I will speculate about them when their time approaches. That is the best I can do tonight, thank you everyone for your patience. Now that school is over I get to go back to Northfield and watch games on Friday nights. I'm crossing my fingers that when I return to school in the fall Victory will be on. Until then I will have ample opportunity to work on this website and voice the opinion of this fan. 9th- This was possibly the most frustrating moment of the entire game. The M's sent Eddie G. out to face his old teammates and he did not disappoint; his old teammates that is. Eddie was true to form: a couple of singles, and then, with two outs, he allowed a key run-scoring hit to tie or lose the game. Last night, that hit came from the most unlikely of sources: our very own Torii Hunter! Listening to the game, I could just picture the swing Torii would put on the 3-2 pitch from Eddie. It would be a little back-door slider (or splitter in Eddie's case) and Hunter would pull his head out and miss by about a foot. Somehow, miraculously, Torii instead lined a double to right field. Guzy scored easily from second, but Koskie was thrown out at the plate on a TERRIBLE call by the home plate ump. Like the vast majority of you I couldn't actually see this call, but I'm willing to take Gordo and Gladden's word for it. Koskie, who is usually pretty mild-tempered, thought the call was so bad that he was tossed from the game for arguing. So was Wayne Hattaway, which would have been a very entertaining sight to see. Damn the ump and damn Victory! 10th- Lew Ford, who is still the official player of this blog, connects with a one out double. With two outs, Cuddyer comes through with a single to left. Unfortunately, the throw from Raul Ibanez is a good one and Ford is... "OUT at the plate! Ohhhhhh, my," to quote John Gordon. 11th- The entire inning was just one big disaster from the get-go. It starts promising enough, with a leadoff Stewart walk, but he is erased on the subsequent Guzman bunt. Boys and girls that is one of baseball's cardinal sins: you have to get the sacrifice bunt down! What happened next is something that no mere box score can explain. With Mientkiewicz at the plate, Guzman takes off for second. Mientkiewicz lines a single to right, but for some reason Guzman thought that Ichiro caught the ball! He touches second but then turns and GOES BACK TO FIRST!! Instead of a single, all Dougie gets is a lousy fielders choice! I know the hit-and-run play wasn't on, but Guzy, what were you thinking!?!? You see, that is why we have such novelties as "third base coaches": to help prevent these kinds of debacles. Instead of first and second with one out the Twins now have a man on first with two outs. Naturally, Dougie Baseball is picked off trying to steal a couple pitches later. 14th- Guzy started the inning off by reaching on an error. 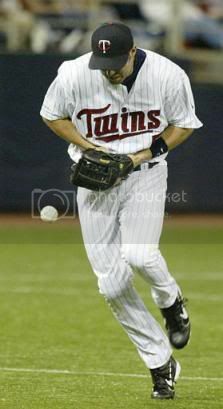 Mientkiewicz was bunting, but for some reason towards the left side of the infield (much to the dismay of Dan Gladden). The bunt was a shallow pop-up, and Spiezio nearly made a diving catch charging in from third. Guzman had to wait and see if the bunt would be caught, so the catcher forced him out at second. Another botched sacrifice! Punto walked and after a Ryan groundout, Jones was grazed by a pitch to load the bases for our man Lew! But Lew couldn't deliver (hey, nobody's perfect) so the game remained tied. As somewhat of a pessimist, I was predicting the Twins' doom the moment Seth Greisinger entered the game. He actually did a nice job for two innings, but the veteran line-up of Seattle was just too much for him in the 16th. Too bad the Mariners had to win on yet another cheap call by the umpire! I can't wait to see the highlights tomorrow, just so I can see how bad those two calls (the ones in the 9th and 16th) really were. I've got 9 a.m. class tomorrow so I'd better get at least a little sleep. Today's entry should at least help those of you who chickened out and didn't stay up until the end of the game. John and I also feel it is important that we consistently post at least six days a week until we are better established. Coming up later this week we have (hopefully) our first guest writer! Stay tuned for that, and good night everyone! Twins Chatter has learned that if the season were to end today, the Twins would be back in the playoffs as the number two seed. Because April counts, we think it is never too early to analyze a possible post-season match-up. This year's opponent looks to like it will be those cursed Boston Red Sox. How do the teams match up in a five game series? The following is a breakdown of the series. Remember, you saw it here first! Joe Mauer will be healthy and adds balance to the batting order while Jason Varitek has been a steady early season contributor to the middle of the Boston order. Mauer gets the slight edge defensively. Doug Mientkiewicz wins hands down the defensive side of this battle. David Ortiz was a strong MVP candidate last year. Both have started off well offensively with Ortiz hitting for a little more power. Luis Rivas has been terrible to this point and anything he contributes to this team is a bonus from here on out. Nick Punto has been better and a pleasant surprise. He stands to come down to earth in the coming months. The two-headed monster of Pokey Reese's glove and Mark Bellhorn's glove could give the Twins problems but is more likely to cause a mere whimper. 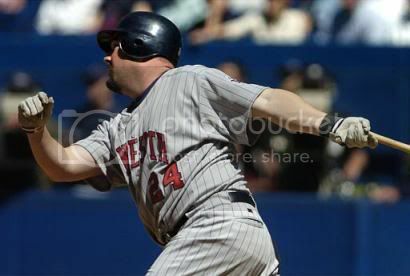 Corey Koskie has been a strong member of this team despite early season back troubles. As long as he holds up expect a great series from him. Bill Mueller is not the player he was last year but contributes a solid glove. Shortstop - Cristian Guzman has shown some life of late and could cause a lot of problems in a short series but it will probably be an up and down season. Nomar Garciaparra has been injured all season but has some time to get healthy and put it all together. He's in a contract year and one of the best shortstops in the game. Left Field - Shannon Stewart is the catalyst of the lineup. He never has a bad at-bat. His defense isn't spectacular but adequate. Manny Ramirez is one of the best hitters in the game and has exhibited some extra fire this year. His defense is a liability. Torii Hunter is still coming back from his early season injury and his numbers are not strong. He adds stability to the lineup and his glove is worth half a run a game. Johnny Damon is one of the best lead off guys in the league but Boston doesn't steal a lot of bases. He could drive Twins pitching insane. Right Field - Trot Nixon, like Garciaparra, has been injured to start the season. He is a playoff performer and solid all around player. Jacque Jones is an exciting professional hitter who will have a year under his belt to feel comfortable in right. Who will it be for the Twins, Lew Ford, Matt LeCroy or Justin Morneau? It doesn't matter because the Twins have the luxury of riding the hot hand. Kevin Millar was a huge part of Boston's success last season but has started off slow this year. He is a great hitter and his fortune could be his team's in this series. The team has Twins-killer Ellis Burks in reserve if they need him and his knees hold up. Boston has weapons and is likely to go out and get what it needs at the trading deadline. Many of them are over the hill players and mixed parts that don't necessarily fit together. The Twins have a chance to develop a lot of depth by the playoffs. Michael Cuddyer can play anywhere, Nick Punto has been great to this point and the Jose Offerman/Mike Ryan combo is an excellent pitch-hitting option. The Twins can pick their match-ups at this point. Pedro Martinez isn't even the best pitcher on his team and his best stuff is behind him. He is an intimidator in what could be his last playoffs with Boston. Brad Radke has been a playoff horse for the Twins. Curt Schilling wins in the playoffs. He has started the year off great and sets the tone for his team. Johan Santana has worked through his problems and has the potential to be really tough in a short series. Kyle Lohse has been inconsistent his entire major league career and has really struggled with his control in big games. Derek Lowe struggled last year and has been decent so far. He has the potential to take over a game and dominate. Tim Wakefield is a Twins killer who gives Boston flexibility because he can throw a lot of innings. Carlos Silva has been an early season surprise but has never started before and could be blown out by playoff time. He has good stuff and keeps his team in the game. Keith Foulke is one of the best in the game and has solidified the Boston pen. Joe Nathan is in his first year closing but was a great set up man who is 7/7 in saves so far and brings a nasty slider to the table. The Boston Pen was rebuilt this year and so far so good. Williamson, Embree and Timlin can be really tough but they are also capable of imploding at anytime. The Twins pen has kept itself afloat to this point and will get an added boost from Jesse Crain and Joe Mays before the year is out. JC Romero will be the key to its success. The Twins are hungry and an early exit will not be acceptable this year. They always play Boston tough. They also play station-station baseball, which could make the difference. This could be Boston's year. They built this team to beat the curse and the expectations are huge. Ron Gardenhire has been here the last couple of years and has had a chance to learn. Pitching coach Rick Anderson has done a great job getting the most out of pitchers. Terry Francona is in his first year but is an excellent manager and under the pressure to win. Texas vs. Chicago? Yikes! It might still be a little early for that one. Any Thoughts or Comments? Email me at johnbetzler@hotmail.com. Last week, we introduced a new feature called the “Sunday Conversation”. To say the least, while the concept itself was solid, the execution was a little lacking. We’re introducing a slightly more “user friendly” version this week that we think you’ll all enjoy a lot more. Let us know your answers to the questions proposed here (or just a general thought) in the comments section below. It's a bit long, but an extremely good read. Question: First of all, has the early performance of Carlos Silva surprised you at all? Ryan's response: "I have to agree with you there John- I have been pleasantly surprised by the early returns from Silva, but I also have to wonder if he can keep this up over the course of a full season. The new Field Turf seems like it will benefit Silva the most out of all our starters, but in the only game I've seen him pitch (Friday) he gave up an inordinate amount of fly-ball outs. But after the game, I recall Henry Blanco saying that Silva's power sinker was "nasty", so I’ll assume he can still be effective even if he’s getting more fly-balls. Overall, I would say that I'm cautiously optimistic." We got two great, albeit wasted, starts from Johan Santana and Brad Radke this weekend. Do you think they have turned a corner and are ready to heat up or is this just more inconsistency? RM: "I was as shocked as the next Twins fan to see that those two previously ineffective pitchers had turned in back-to-back stellar performances. Radke has already shown flashes this year, and he has traditionally had some success against the Halos for some reason (2002 ALCS, complete game shutout last year). Santana's outing today, even though I wasn't able to catch much of it live, was what really impressed me. His line sounds like the Santana of old- 7 innings, 6 Ks, 1 ER in 108 pitches. Looks like he struggled a bit early on, but hopefully he has now found the elusive feel for his devastating change-up and is ready to pitch like this for the rest of the season. In my experience, the change-up is a pitch that requires more "feel" than just about any other pitch- it often doesn’t come back as easily as say the fastball or breaking ball. Johan didn't pitch in winter ball for the first time in his career, and it seemed like he was always just a little behind schedule up to this point. Now it seems like he's finally caught back up." JPB: Excellent winter ball point. I think the only thing shocking is that these two haven't performed yet. Radke is a pretty good pitcher and Santana has a chance to be great. Brad always has some rough spots in his season before rattling off about 10 great starts in a row, so at least he got them out of the way early this year. Santana is the key to this team’s success in the long run and this is the 3 or 4th start in a row that he has built on. With these two guys on track there aren't going to be many more weekends where the team loses both games in which they pitch. Two rather disturbing trend emerged from Saturday and Sunday's games- the Twins utter lack of ANY kind of offense, and the re-entry of J.C. Romero into his patented (2003) 'implosion mode'. Do these trends concern you? JPB: “We all knew this was coming with the offense. They were just hitting too well to keep it up. They aren't going to be as good as they were but they also aren't going to struggle as much as the last two games. The Twins also have a lot of hitters with more on the way. I think it was more telling that the starters were effective because they had been so bad up to this point. The hitting isn't going to come down near as much as the pitching is going to come up. RM: "I might be overreacting a bit because the only inning I heard today was J.C.'s disaster, but this concerns me quite a bit. I'm willing to overlook Thursday's nightmare performance (0.2 innings, 4 ER) and even Saturday's (since he only allowed the one hit). But today's outing really broke my heart. I realize he was going against one of the best lineups in the game, but here Gardy entrusts our supposed ‘best’ reliever with the task of keeping the game tied and he falls utterly on his face. All I could think was, 'J.C., PLEASE PLEASE don't go back to last year. Please. Last year, we had the back-up net ready to bail you out (LaTroy), but this year J.C. is it. There is no one else.’ If J.C. falters again, the Twins bullpen is doomed. There is no doubt in my mind. For positives, at least he wasn't walking guys like crazy. He has been throwing strikes for the most part, but has been getting hit hard. Today, I was concerned that he was unable to put a couple of key hitters away when he got 2 strikes on them. But we'll see. It is definitely still early." Don't look now but Cristian Guzman is hitting .286 and was seen driving the ball this weekend. Is it possible he could finally be doing something for this team? RM: "I'm completely baffled by Guzman's recent 'hot' streak (if you can call it that yet). If he is still in fact capable of driving the ball, why hasn't he been doing it for the last 2 years? This is the longest period of time since 2001 (that I can remember anyway) that Guzman has looked this good. The extra base hits haven't been there yet, but if he keeps hitting the ball this well, they can't be that far behind. What is causing this? Is it the fact that he is in a contract year and money is the only motivational technique that appeals to Guzie's laid-back personality? Or is it something deeper than that? And why hasn't any of this rubbed off on his soon-to-be ex-double play partner Luis Rivas? Tune in next time for answers to these questions and more on our next episode of Unsolved Mysteries." Check back next week for a new installment of the "Sunday Conversation". If you have any ideas for questions, feel free to drop a comment below sometime this week or send a quick e-mail to me (twinsfan21@msn.com) or John (johnbetzler@hotmail.com). On the surface there seems to be nothing wrong with this statement (although I can’t imagine there are many regular readers of the Rocky Mountain News that give a hoot about the Twins- I couldn’t care less about the Rockies). Ringolsby goes on to cite some facts to back up his argument: the Twins’ relatively high team ERA (now exactly 5.00), their less-than-stellar defense thus far (21 team errors through Friday), and the team’s lackluster strength of schedule (games against Cleveland, Detroit, KC, and Toronto). You know what I say to all of this? Phooey. The problem with Ringolsby is that he didn’t look much past the statistics. Point one: the Twins 21st ranked team ERA. Sure, 5.00 isn’t great by any means, but a closer examination reveals that it isn’t nearly as bad as it looks. The bullpen’s ERA is a respectable 4.64, and that includes terrible performances from guys like Pulido, Thomas, and Greisinger. This is also a bullpen that could receive two huge shots in the arm come June/July: Grant Balfour and Jesse Crain. The starting staff is mostly to blame for Ringolsby’s accusation. Once again, a closer look reveals that the situation can only improve from here on out. We all know that Brad Radke (5.64), Kyle Lohse (6.51) and Johan Santana (5.40) will all undoubtedly pitch substantially better than they have thus far. Carlos Silva has been a pleasant surprise with his 4-0 record and 4.02 ERA. The point is, this staff has grossly underachieved so far and it will shape up, hopefully sooner rather than later. Ringolsby conveniently fails to mention this. Just as the pitching staff is undeniably bound for improvement, so is the Twins’ shaky defense. Friday’s two errors bring the season’s total to a whopping 21 in 22 games played, an unheard-of ratio for a Twins team. The main culprit has been the infield: their 13 errors rank tied for last in the major leagues. This is a rather startling statistic, but let’s consider past performance. These same starting five (Koskie, Guzman, Rivas, and Mientkiewicz) have anchored infields that finished 2nd and 3rd in the majors in infield errors the past two seasons respectively. Now, they’re going to have to really tighten the hatch in order to match that feat this year, but there is absolutely no reason to believe that this infield will go from being one of the game’s best to one of the worst in just one year. It’s just not going to happen. I love the new turf, but I think it is at least partially to blame for this odd influx of errors. Once the players grow accustomed, the defense will shore itself up. Ringolsby’s last point is one that I can’t debate as well. Until Friday’s impressive win over the “best team in the American League” (to quote Eric Chavez), the Twins had yet to play any potential playoff teams- unless you consider the Royals contenders (*snicker*). I think the next couple of weeks will speak volumes about this team. Tonight was just the beginning. Now, I also realize the hitters will probably come back to earth somewhat. I firmly believe Twins will continue to be a very good hitting team, but probably not second best in the majors (just as Detroit isn't going to lead the league in runs scored). Where the casual fan might find this blurb by Ringolsby as a foreshadowing of doom for our beloved Twinkies, I actually see it just the opposite way: If the Twins have started 15-7 with all these factors working against them, just imagine what they can accomplish when things really get going! I don't know about you, but I can't wait!